We welcome anyone interested in being hosted for a meal who is attending our services. We are hosting a casual seudat shlishit between mincha and ma’ariv on Saturday from around sunset until shabbat is out. This is open to everyone free of charge. This is a very casual lite meal, salads, tuna (nothing to write home about), a drasha, and zmirios. 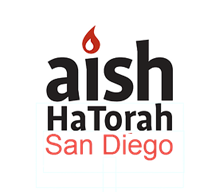 Shabbat San Diego Project, the Aish HaTorah San Diego and Orot HaCarmel communities are joining for a special UNITY SHABBAT event and we invite you and your family to be part of it! Let’s join together as we pray, sing and celebrate Shabbat. Our students make challah every week! Join us for an amazing program on a Sunday afternoon. Enjoy a meaningful painting session that cultivates social responsibility. The Butterfly Project is a call to action through education, the arts and memorial making. It uses the lessons of the Holocaust to educate about the dangers of hatred and bigotry and cultivates empathy and social responsibility. Participants paint ceramic butterflies that are permanently displayed as symbols of resilience and hope, with the goal of creating 1.5 million butterflies around the world—one for each child who perished in the Holocaust, and honoring the survivors. Join us as we celebrate Shabbat honoring the Israeli Defense Forces with 2 Chayalim Guest Speakers and a delicious dinner, in a warm Shabbat atmosphere. From the Kiddush and traditional dishes, to the meaningful discussion & inspiring song, this is a Shabbat experience you won’t want to miss. Will end at the location of next activity. Followed by Shabbat Nigunim & Arvit. After, transportation will be provided to SDJA and the Havdalah Celebration. 10/23 - 5 ways Shabbat can improve your life! All reservations before Oct 23 are Free! This dinner is made possible due to generous donations. Please consider donating to this great cause. A Suggested donation is $18/person $5/child. Address: 7015 Chapala Canyon Ct.
Congregation B’nai Shalom invites you to Shabbat services at 10am. Services will be followed by a pot luck dairy lunch on our covered patio. Rabbi Hillel Silverman will be conducting Lunch and Learn for this special Shabbat. Free of charge. Congregation B’nai Shalom invites you to Shabbat services at 10am. Services will be followed by a pot luck dairy lunch on our covered patio. Rabbi Hillel Silverman will be conducting Lunch and Learn for this special Shabbat. 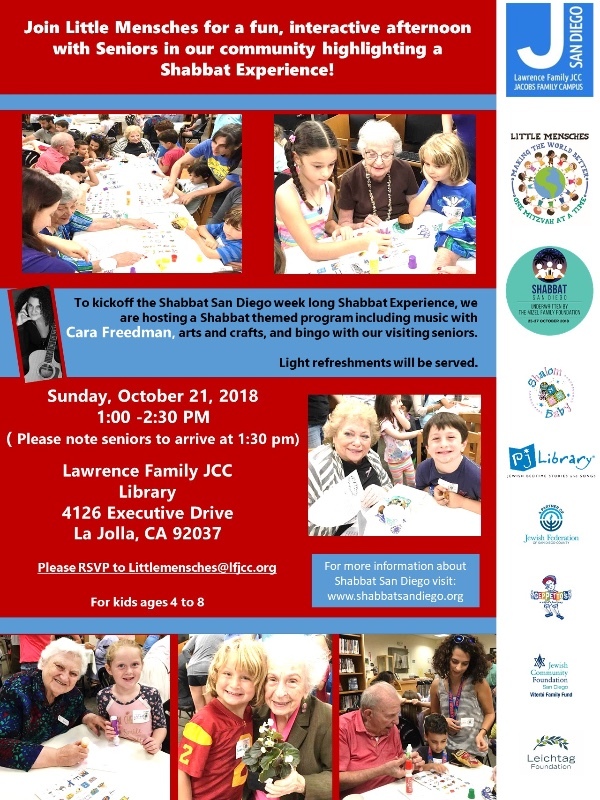 Balboa Avenue Older Adult Center (BAOAC) Celebrates Shabbat San Diego: JFS will celebrate Shabbat with programming for adults 60+ at our Balboa Avenue Older Adult Center on Thursday, October 27. College Avenue Center: JFS will celebrate Shabbat with programming for adults 60+ at our Balboa Avenue Older Adult Center on Friday, October 27. To learn more about attending any of our Social and Wellness Centers and the schedule of activities, please call (858)637-3040. Every Monday night at 8:00pm, men and women are invited to learn one-on-one with a chavruta (study partner) or to attend a thought provoking class for one hour in a study hall environment. Mentors for everyone, on all levels of knowledge and observance. Coffee and cake are provided. There is absolutely NO cost to participate. Partners in Torah SD is an independent organization that meets at Congregation Adat Yeshurun in La Jolla. Anyone, affiliated or non-affiliated with any Jewish organization, looking to probe a Jewish topic of their choice at any level is welcome. 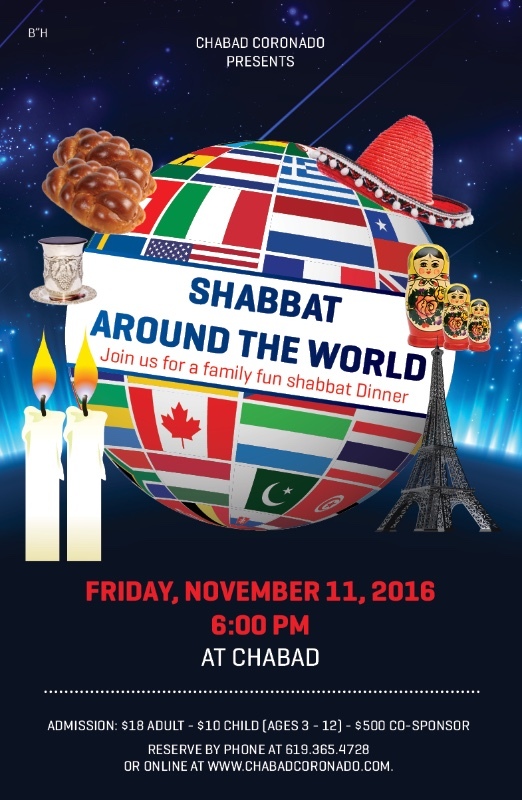 Join San Diego’s Jewish community of individuals, couples, and families for this special Shabbat dinner! In conjunction with Shabbat San Diego, the San Diego History Center is honored to host a communal Shabbat dinner against the Jewish exhibition in our museum. 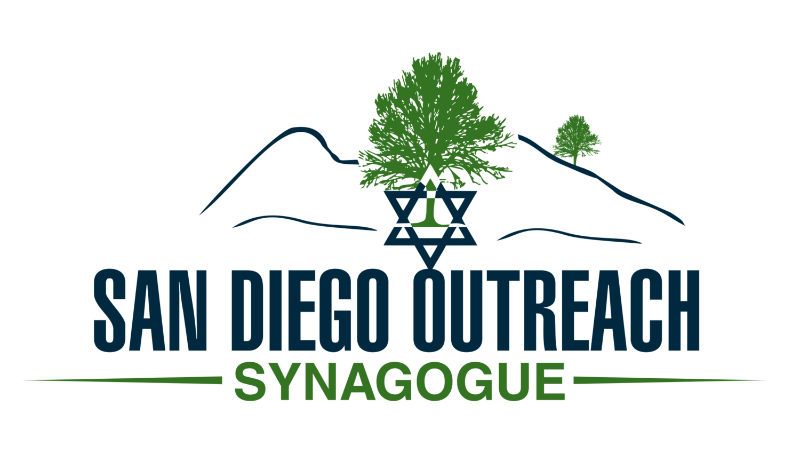 With an optional service at Ohr Shalom and an exclusive tour at the San Diego History Center, we invite friends and family to participate in a full experience. Sharing a delicious meal and celebrating the magic of Shabbos can be a meaningful experience that turns acquaintances into friends and friends into family. 10/23 - "What's the point of Jewish learning: Two Rabbis, Orthodox and Conservative discuss." Lively musical service followed by Kiddish and light vegetarian dinner. Address: 3410 Mt. Acadia Blvd. 10/22 - Shabbat Art Work! Shabbat Barbecue, October 27, at 6 pm, in our social hall. Looking forward to seeing you there! Address: 4950 Murphy Canyon Rd. We’ll have some home hospitality for Shabbat dinners. We are so excited to announce our upcoming Shabbaton on October 26th, 27th and 28th. 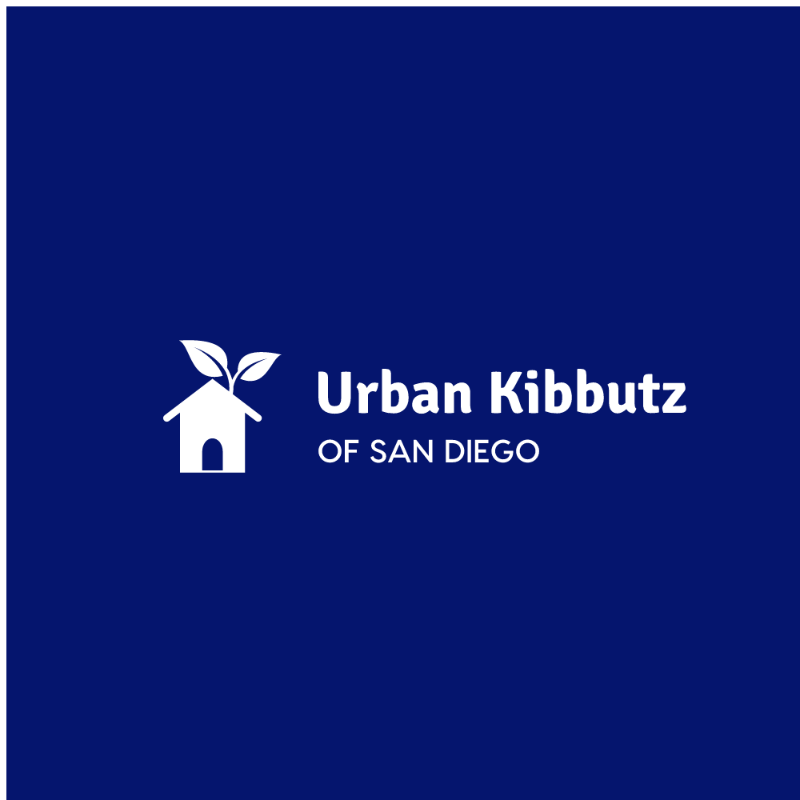 Urban Kibbutz will be hosting the Shabbaton, during Shabbat San Diego weekend, at Emerald Village in Vista California, about 40 minutes from downtown San Diego. We have planned a full schedule. Urban Kibbutz will be serving delicious Shabbat meals. 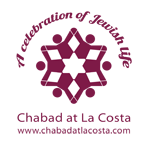 We will host a kids program so that parents can join in on some of the discussions and classes. Emerald Village is a beautiful intentional community located in Vista, CA. They have an organic farm, lots of adorable farm animals that the children can feed, a beautiful heated pool and jacuzzi. The facility has bathroom and showers but we will be camping. So please bring your tents, and sleeping bags! Looking forward to spending a wonderful Shabbat together!